$694 (approx. €608, £525) with free shipping. I was in two minds whether to call this painting ‘Between the Dark and Dawn’, a line borrowed from Yeat’s poem Crazy Jane. Have you experienced that wonderful confluence when the moon is visible in the sky at the same time as the sun? Often it’s barely discernible in a bright blue sky. In this painting though, the roles are reversed. The moon high in the sky fills the surrounding clouds with mysterious light. Meanwhile, on the horizon, the white lemon light bottom right bursts forth across sea and land, a sure sign daylight is coming. For a while, the two co-exist in a wonderful harmony of cool and warm light, mingling until the moonlight cedes its place to the day. On land, sleeping houses overlooking the sea miss that spectacle witnessed by the stationary poles standing tall. Soon the fleeting moment will be gone. The village will stir into life as soon as the first light comes on in one of the houses. 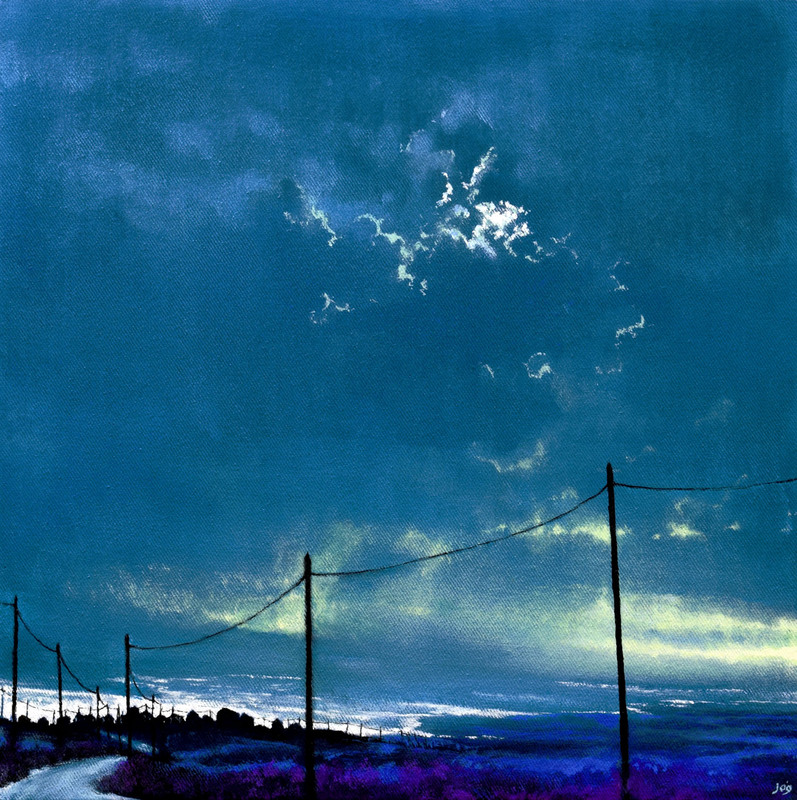 This 5th painting in the series also features the sentinel-like telephone poles and a road leading to the sea but each one describes a different atmosphere, a different feeling accomplished with a different palette. Here, I used acrylic washes, building colour to arrive at a richness and depth, particularly on land with powder blue and violet. This piece feels like the darkened houses are cocooned by the surrounding world, in slumber on the bed of land and blanketed by sea and sky as fine veils of rain stretch out to touch the houses. This gives the painting a dream-like quality. This has such an intriguing enigmatic atmosphere John, truly magical. The houses on the horizon sillhouetted against that glorious sky are a wonder and contrasts with the bright light of the dawning of a new new day, full of hope. Beautiful! Thank you for your lovely comment. It’s great to hear that you found the painting has a magical quality for you. With regards to the houses you mention. I forgot to say in my text of how the finished piece reminded me of the opening of ‘Under Milk Wood’ Of course my piece has a moon though. sloeblack, slow, black, crowblack, fishingboatbobbing sea’. Thanks for adding this note about ‘Under Milk Wood’ and I do see what you mean! Such wonderfully evocative language conjures up strong visual images as realised in your lovely painting. Once again poetry and art complement each other and inspire the imagination. Your ‘Road to the Sea’ series has been a joy (so far).